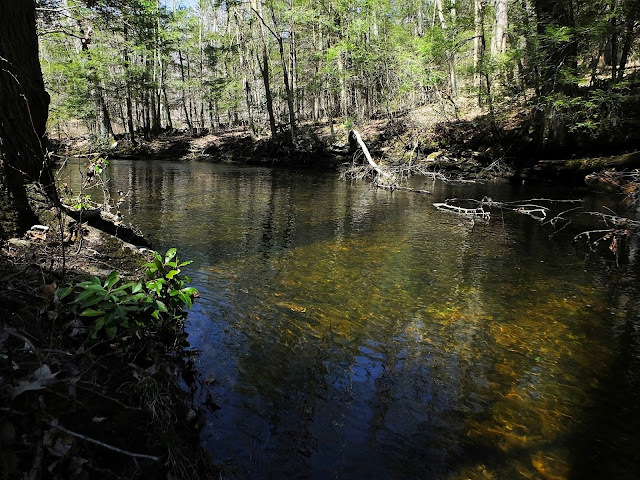 It is a commonly held belief that wild brook trout populations are uncommon, and that they don't exist in watersheds that are heavily developed. That's not really true. 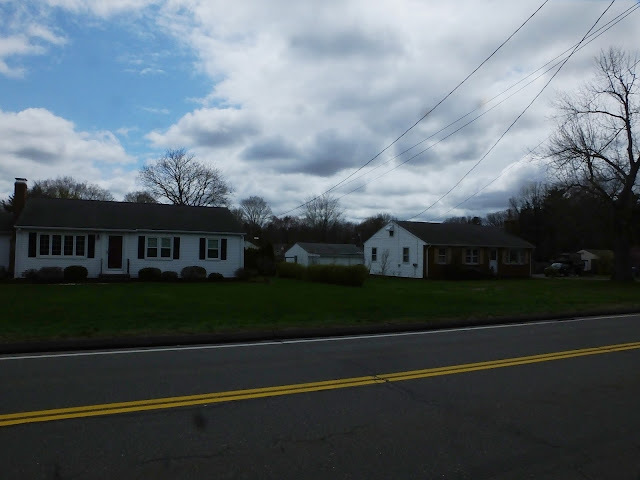 I've found that a disproportionate number of the wild brook trout streams on my list run through primarily suburban environments. One I fished on Sunday is an exceptional example of this. From source to mouth there is not one point where the stream is any more than 50 yards from a house. 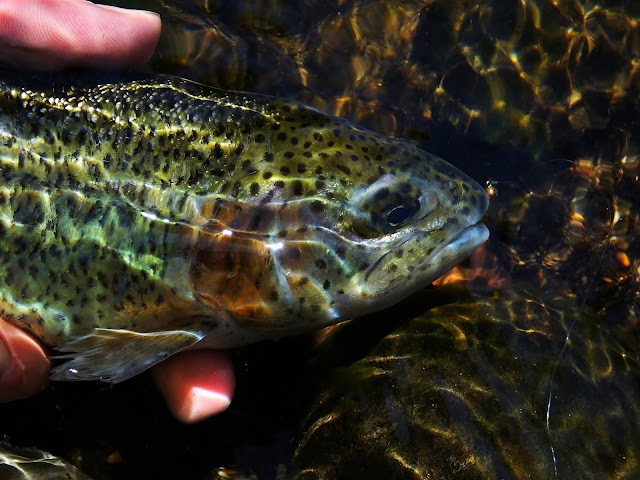 Access is difficult, and the fish are very concentrated into small areas, but some are quite sizable so it is worth the effort. Being well versed in biology and geology, it doesn't surprise me when I come across these streams any more. They still fit the parameters that are required for brook trout survival. 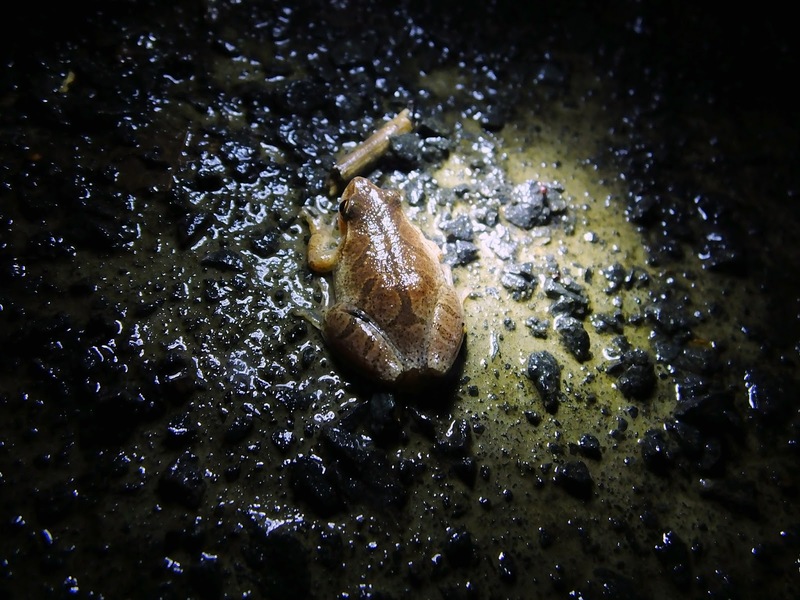 Their existence in these places is a little more tenuous, because all it takes is one idiot to dispose of waste into a storm drain and a huge population bottleneck occurs. These streams actually come and go, populations rising and falling dramatically in a non-cyclical pattern. The problem with a rapidly fluctuating population is that it increases the likelihood that it will eventually hit zero. 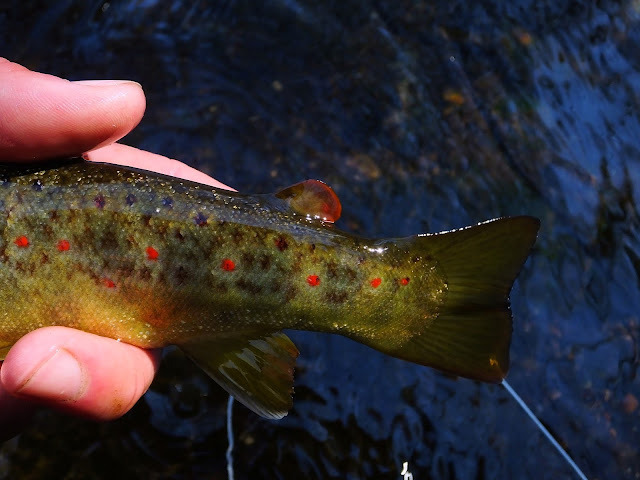 So, though it isn't surprising that these suburban and urban streams do have wild brook trout, I am not shocked when I run into one that has died. These are the streams on the edge, they will be the next ones to slip away. These are the ones that we hurt when we take too long a shower in late summer. These are the ones that we hurt when we wash our cars in the driveway. These are the ones that we hurt when we dump four bags of lawn trimmings in the ravine. It doesn't take much effort to keep these streams habitable. While driving between tributaries on Friday Ben Bilello said he was thinking about just switching gears over to trout fishing this season. Trout, trout and more trout, just trout. Neither of us had the best attitude about the goings on of the day, pretty much immediately after fishing the first spot for 10 minutes... at least that's when my mood shifted towards uncertainty and slowly drifted towards complete pessimism. 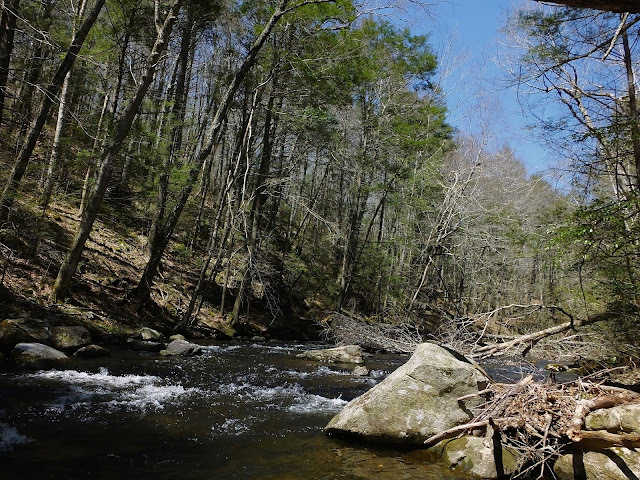 Fishing for resident trout, despite what those who do little but may say, isn't a particularly mysterious endeavor. 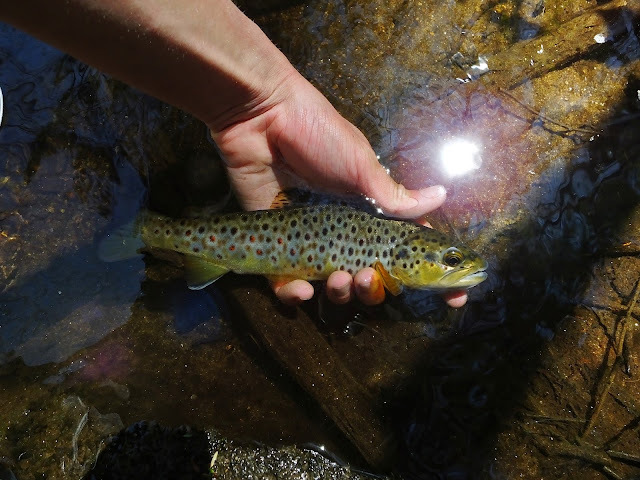 The movements of these fish are slight, the variables affect them are often very noticeable, and it is possible to catch a trout in CT every day of the year if you're so inclined. By contrast, spring migratory striped bass, sea run browns, walleye, and herring are influenced by an immense number of variables. Couple that with dramatically declined populations and spot inaccessibility and you have a recipe for frustration. It takes an immense amount of time to get these things down to a science. There is no shortcut. Networking has sullied spots like the Housatonic and Cape Cod Canal, people close in when the bite is on and it lasts. But that doesn't work in this fishery. The fish are there and then they aren't. It may be an hour, a day, a week... there is no certainty. The conditions change constantly. I sympathize with Ben, I've been tempted to go where things are more comfortable, more predictable, and I have more time than he does. 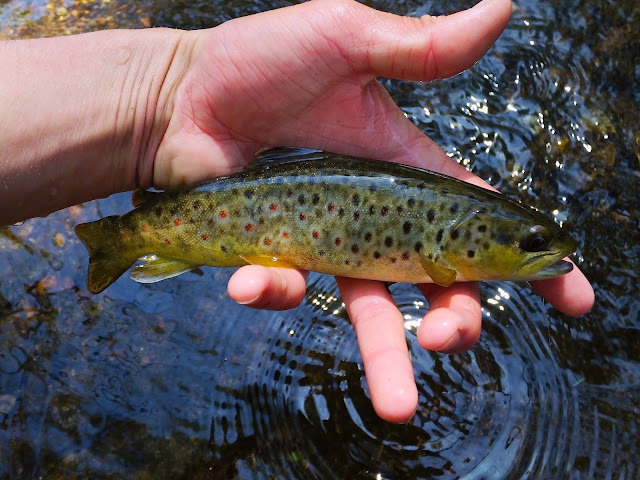 But I spent five years fishing for trout and wishing I could be chasing the migration, and dammit when I got to experience it for the first time, like catching my first wild brookie, catching my first striped bass on the fly, hooking my first albie... it was a new kind of high and I'm not sure I can live without it anymore. So out I go, in the rain, in the dark, in the wind, in the floods and almost unfishable tides, trying to be in the right place at the exact right moment to intercept perfection. I got the taste and the damage was irreparable. Ben and I did not get it right on Friday, though I suspect the difference between right and wrong was just mere feet in depth. The night before, I had closed the gap. I wasn't dealt a good hand but I made it count because I had seen much of what variables were presented before, although not all combined. 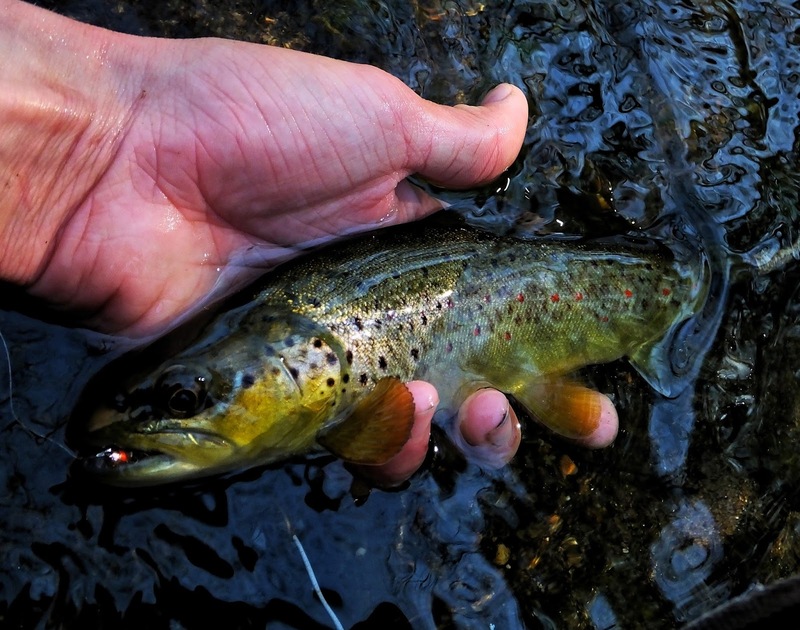 I found fish, I made the right choices about where to move and when, I chose the right flies, and I got my fix. Three casts in a row to the same spot resulted in violent takes. They were small, but they were my first bass of the spring migration, a reward for two weeks of time and effort. The rain and tide changed. The water clarity changed. The fish moved. And for two day's I've skunked while trying to intercept the migration. Tomorrow I'll probably just fish for resident trout, but that doesn't mean I won't be back looking to intercept the migration in just a couple days. It doesn't last, and it has just starting. Letting it all just slip away is not an option. The weather has turned. It has turned late, but it has turned. For days, herring have been filtering in. The numbers aren't exceptional, but they are there. 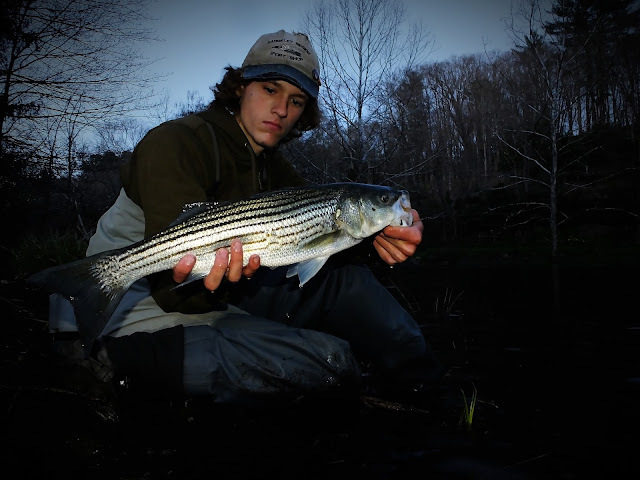 the number of large stripers following them up the tributaries has been minimal so far, but holdover schoolies have joined the party even though most of them are not nearly big enough to eat a herring. The nights were slow early in the week. Herring were there, some stripers were there, but for us, the bite was not. Prey and predators had converged but there is a level of biomass that it takes to get full mayhem and this was not it. 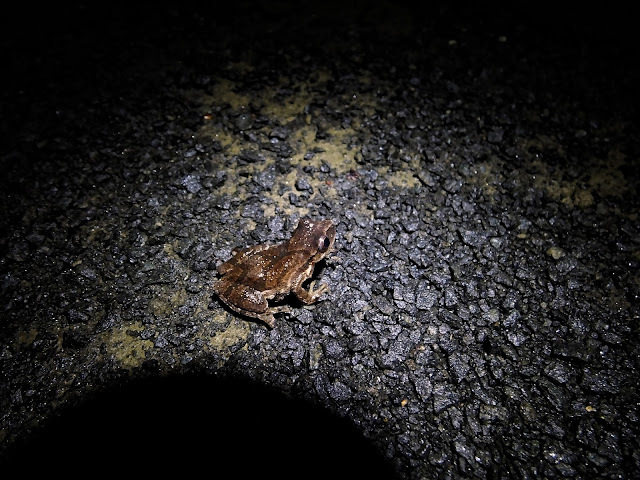 On Wednesday night the conditions aligned for convergence, but not on the tidal freshwater rivers, on small woodland ponds and vernal pools. 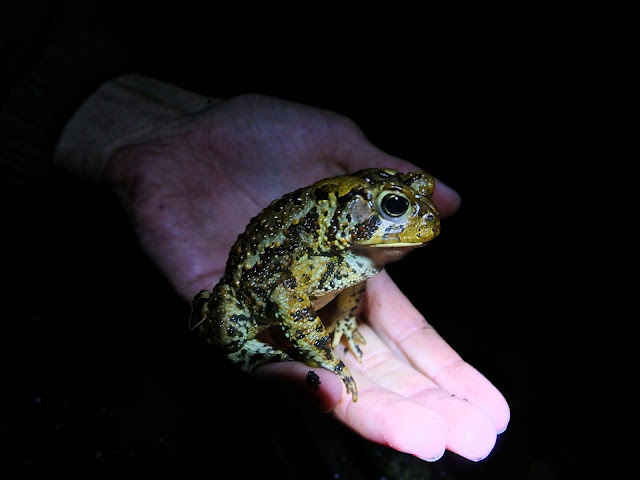 The animals converging on these bodies of water are amphibians; frogs, toads, and salamanders. 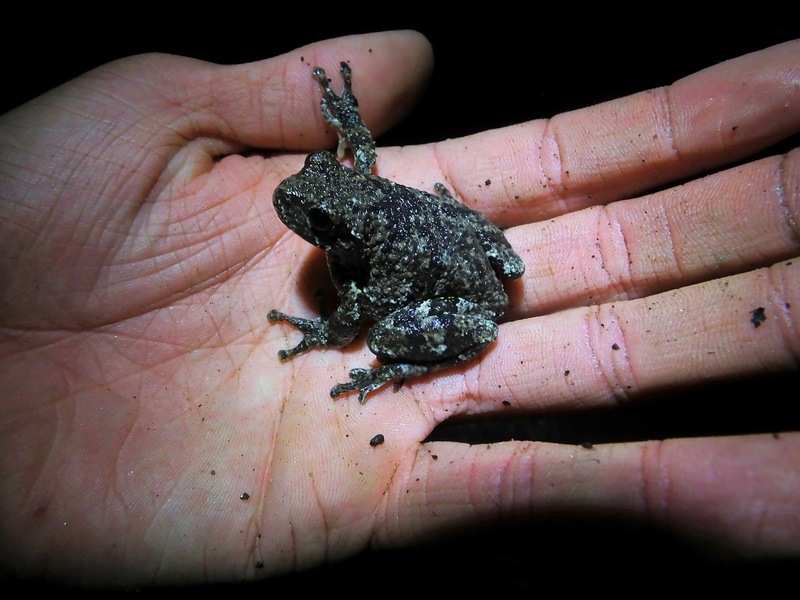 Movers in the night, animals that need things dark and more than a little bit damp. This was the perfect night, the perfect conditions, and I got to be witness to one of the most remarkable spectacles of nature has to offer here in the Northeast. 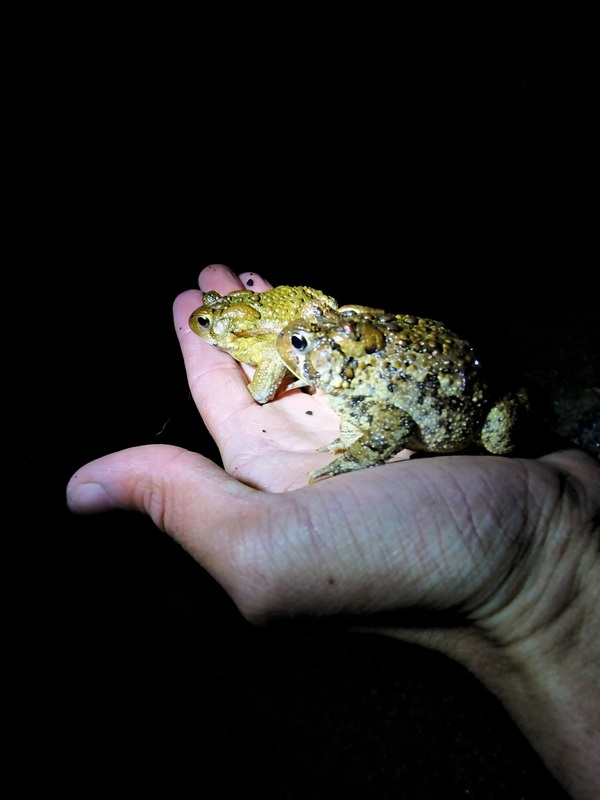 The amphibian migration. 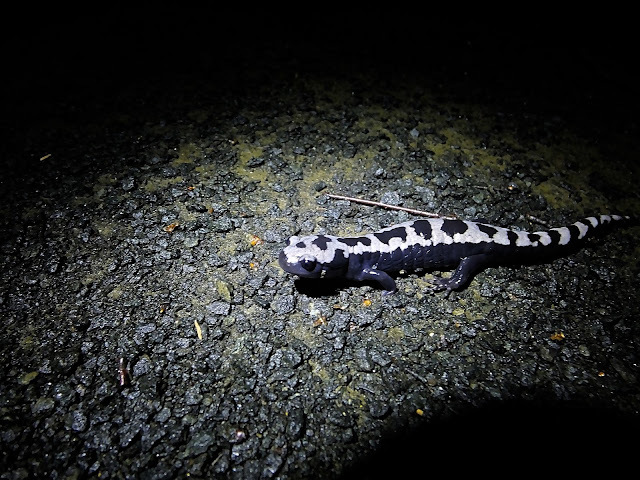 The most exciting encounter of the night was a pair of marbled salamaders. 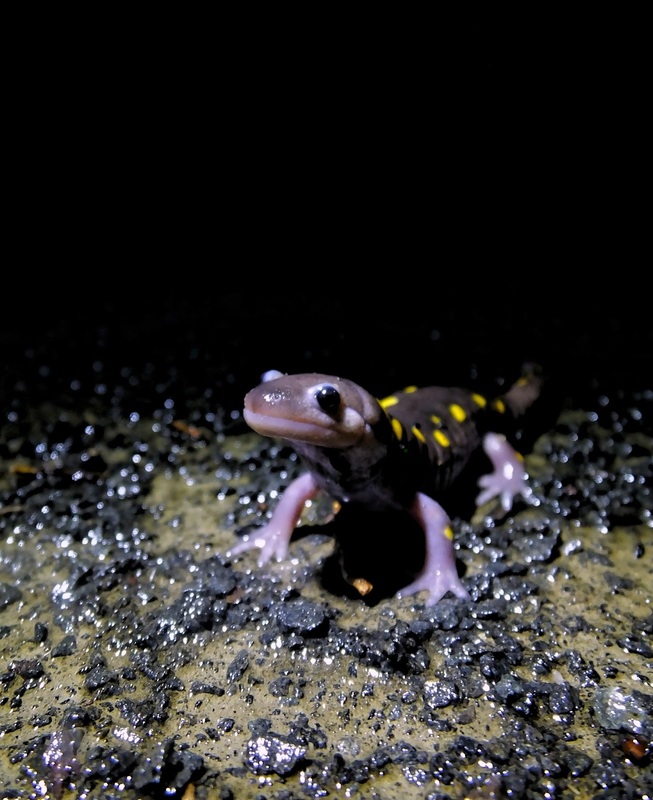 These animals, beyond being very handsomely colored and impressive (as salamanders go) with their short stocky build, are an uncommon species to bump into on a rainy spring night. 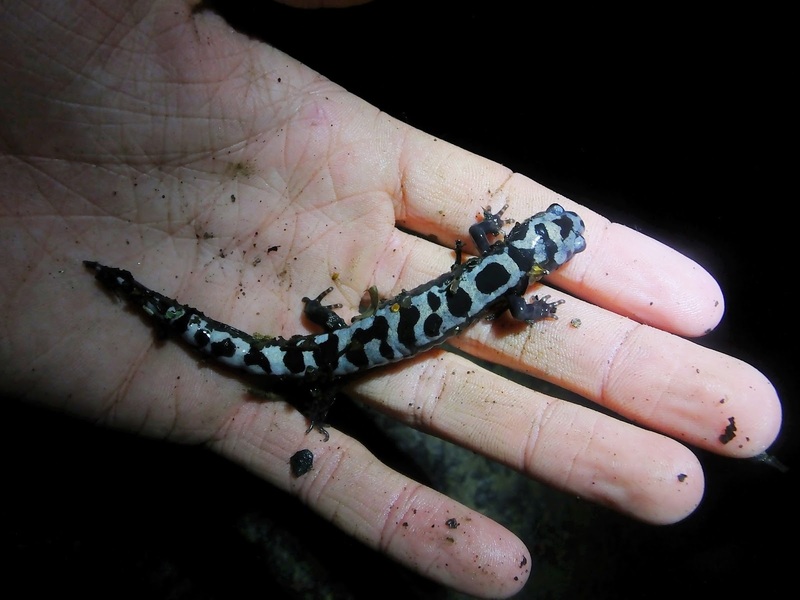 These guys don't march to the vernal pools in the spring to breed like spotted salamanders do. 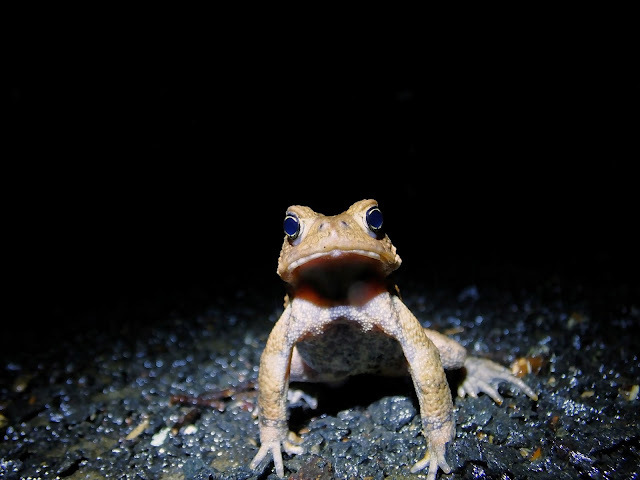 They breed in the fall when those pools are just about dry, leaving fertilized egg clusters in the moist dark spaces under logs or leaves or bark. 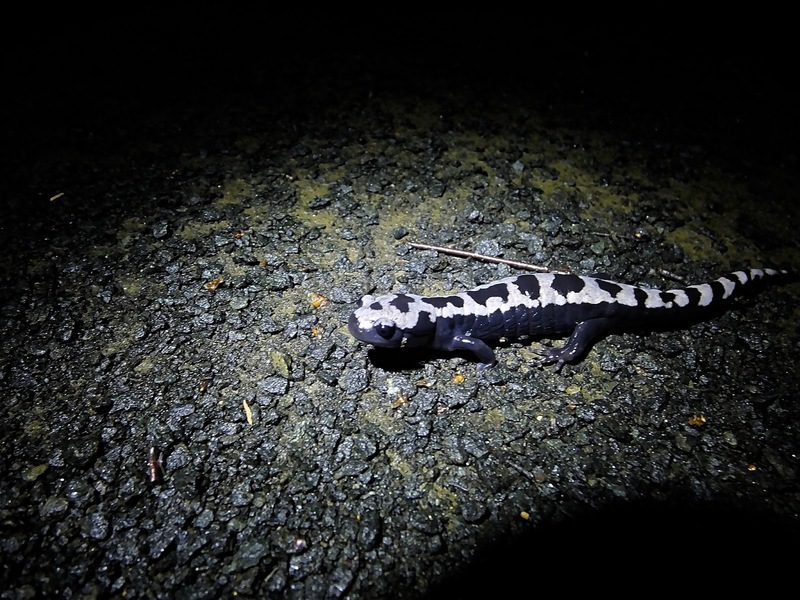 It has been a long time since I saw a marbled salamander, and when I saw the first of this pair my eyes lit up like they did the first time I rolled a rock and saw one peering up at me, wondering why it was so bright all of a sudden all those years ago. I sit here in front of my computer most days feeling the pressure of the modern world trying to convince me I need to grow up. Life is too fast paced now. 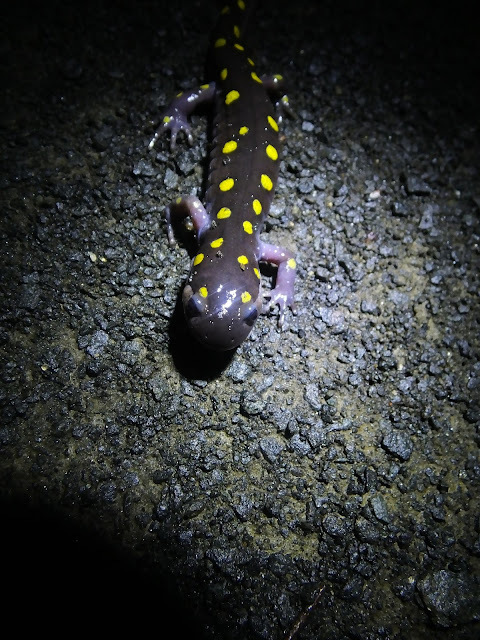 If we don't take every chance we get to be a kid again, to chase a grasshopper, catch a fish, observe a salamander crossing the trail on a rainy night, that's when society has failed. 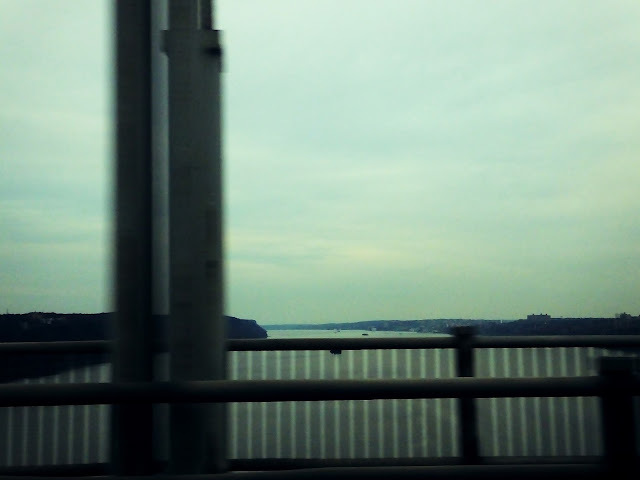 I was on my home river again on Monday. There are two times of year when magic happens there. Magic can happen any time of year, but in spring and early winter it is infinitely more likely. 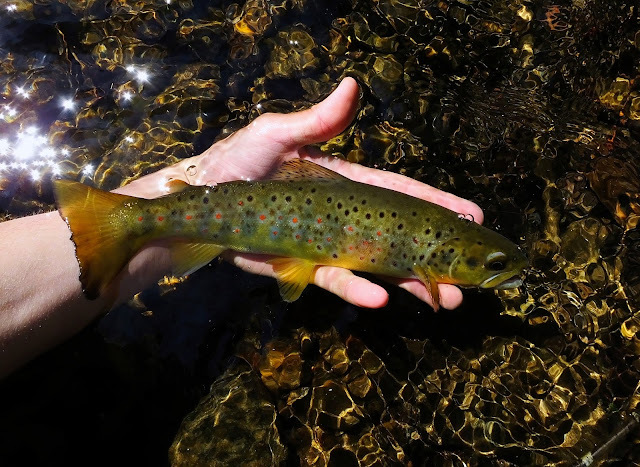 The springtime magic most frequently comes in the form of a prolific Paraleps hatch that gets every trout in the stream looking up, even the rare 15-18 inch giants. So I've been going there looking to catch the magic hatch. I almost materialized on Monday. For the first time this year duns were coming off and the fish took notice, although that only lasted for about half an hour. Leading up to the first rise I saw I fished nymphs. Specifically, Walt's Worm with an orange hotspot. The water was a lot warmer than the previous outing from the start so it did not take long at all to get consistent action. 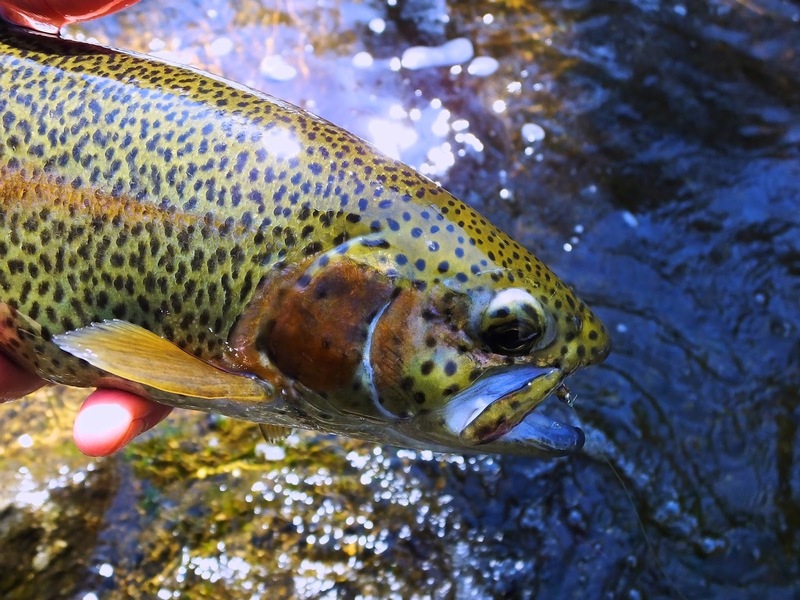 A bunch of wild browns, a couple rainbows, a smattering of salmon... it was a good bite. Then, as I climbed over a new log jam that had created a big slow pool where a set of runs had been, I saw what I had been waiting for. A large riser, gently taking duns. Alright, time to back off and watch. I sat. I watched. I made edits to my leader, greased it up, and tied on my Paraleptophlebia Dun. Then I sat some more. And watched some more. Then, when I felt all was right, I made a cast. I gave it six drifts. The fish rose twice between them, so I knew it had not spooked. I reeled up and sat and watched again. In that time I changed flies twice. It seems silly to tie a fly on and take it off and switch before making another cast, but sometimes seeing the fly tied on is what it takes for me to fully make up my mind. My end choice was a size 12 Quigley Cripple. 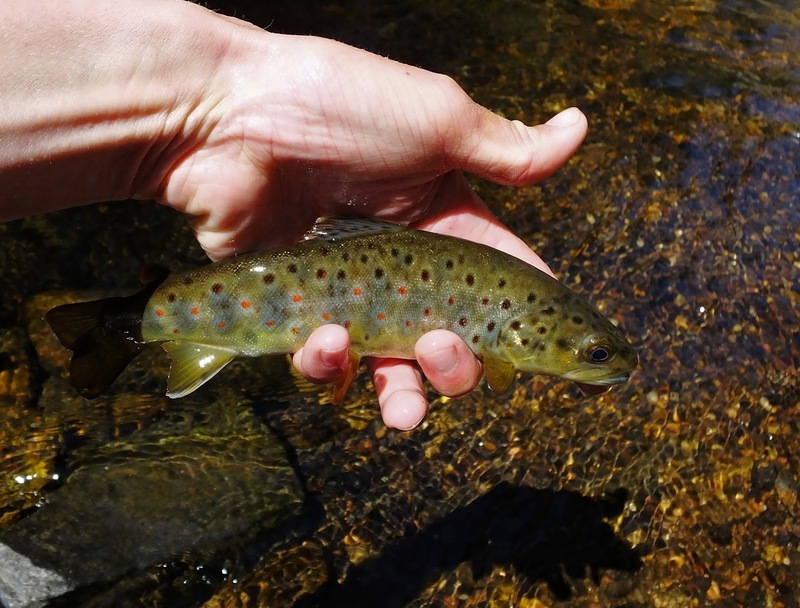 Why fish a size 12 fly over a size 18-16 hatch? These small stream fish aren't as picky as trout on large pressured rivers, sometimes it takes a bigger fly to get noticed. Three drifts and the fly was taken. I waited for the fish to turn and lifted the rod. 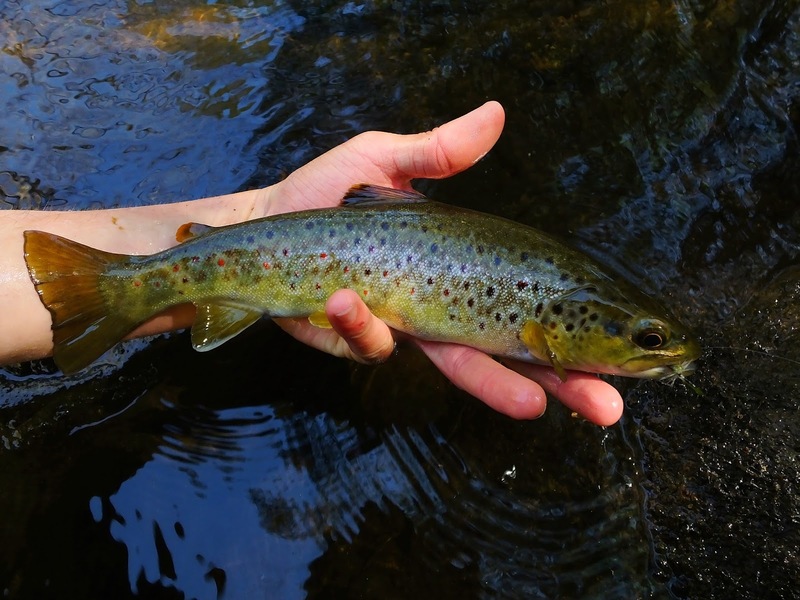 It was a heavy fish, and up until I got a really clear look at it I thought for sure it was going to be the fish of the year for this stream. Alas, it was just a large stocker. 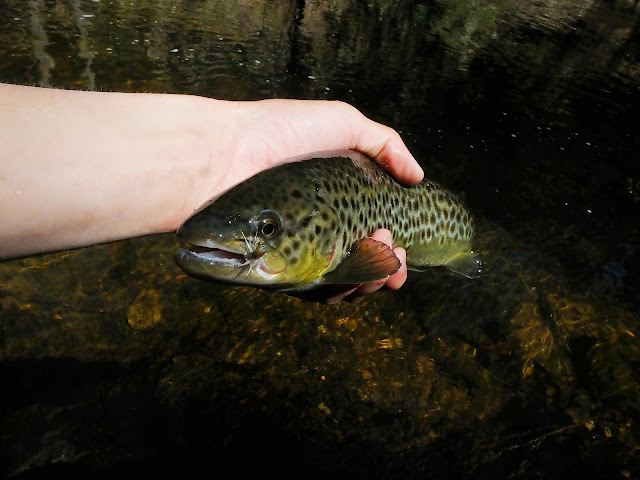 I thanked it for playing along and giving me an exciting fight and continued upstream, picking a couple really good fish on nymphs before getting to the next pool. Once there, saw what I thought was two different risers. I switched to the Paralep Dun and caught the first, a small brown, on the first presentation. I dried the fly and made the cast to the larger fish. 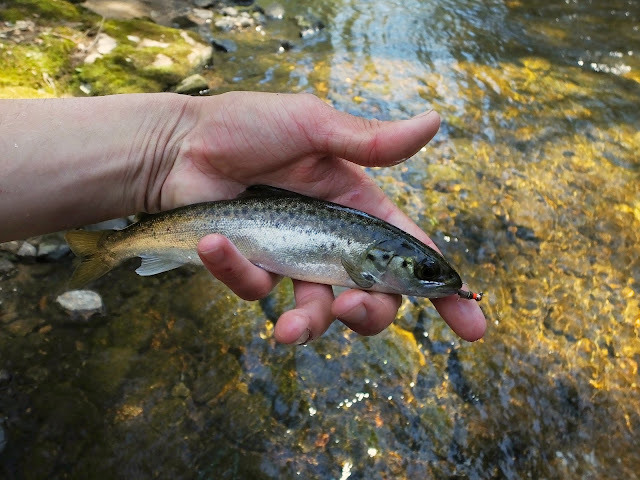 Again, one cast, one rise, one wild trout to hand. A gorgeous one. I was giddy at this point. This is what this hatch is all about to me. To my surprise, when I looked up there was still on riser in the pool, in the exact place of the one I had just caught. I retied with a Quigly. One cast, one rise, one fish. This time it was a holdover rainbow, the same on I had just caught days before in the same spot, and back in December in the same pool too. This time I opted not to take a photo as at this point I think I have bothered it enough, so here's a different photo from the last time I caught him. Unfortunately the hatch was tapering off at that point and I wouldn't catch anymore fish on dries. 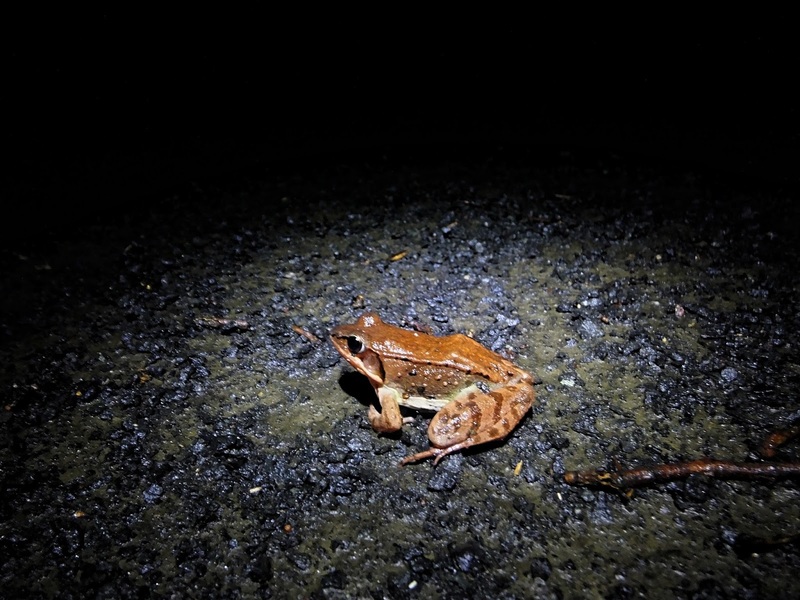 The nymph bite remained steady, however. The fish I ended the outing on was the biggest brook trout I'd caught in my home river in 4 years, a stunning foot long fat female. I wish I could show you a photo of her, I really do, but sometimes the fish does what the fish wants and I'm left sitting there holding my camera wishing I hadn't taken the fly out before taking a photo. Regardless, a great ending to a fair day. No magic, but that may well just be waiting till next time. Yesterday Noah and I went to play with some carp with both bait and artificials. The pond is one Mark Alpert and I call the "Garbage Pond". Because there is an awful lot of garbage in the vicinity and in the pond itself. I take some of it away but it is very much a loosing battle. There are fish there though, and if there are fish I will fish for them. I don't have very many conventional rods and reels any more, and I like fighting fish on a fly rod more anyway, so I fished bread and corn on a 20ft 8lb leader with my 5wt CGR and cast an orange mop fly with my 8wt while the bait soaked. Honestly, the bite was not as great as I expected. But we did catch some carp, and some exceptionally cool ones. Out of all of the fat ad healthy little commons I caught I did get two fish that had a very different color, a type of carp commonly referred to as "ghost carp". The different pigmentation is the result of hybridization between a koi and a common carp. The white ghost carp, which is what both of mine were, have genes past down from Purachina Ogoh koi, also known as Platinum Ogon koi. I caught one on the fly and one on bait. They were very cool looking carp! Of course, in this pond where I had never seen a fish even in the teens in weight, I managed to catch a fish well over 20 pounds. Disappointingly it was on the bait, not on the fly. 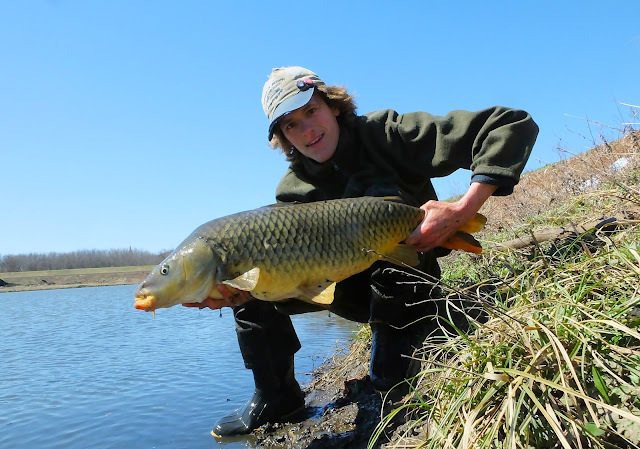 But it was still a carp over 20 pounds on a 5wt fiberglass rod, and that is not to be taken lightly. Any way you do it, catching fish is fun as hell. It just so happens to be a little bit more fun, for me at least, with a fly. So next time I think I'm going to have to catch the giants on the fly, good and proper, instead of on a fly rod with bait.